The pcDuino3 is the universal genius among the SBCs. The aim of the developers was to create a powerful open-source hardware device that can be widely used in various applications. All these targets are achieved with the pcDuino3. The AllWinner-A20 CPU in conjunction with the Mali-400 GPU delivers enough power to handle multimedia (FULL HD) or office applications smoothly and quickly. Thus the pcDuino3 can handle the same tasks like a classic PC under Linux or Android, or ne used as a Media Center with infrared remote control. It needs to be noted that LINUX Ubuntu 12.04, XBMC Media Center, Scratch and Arduino IDE are already installed on the integrated 4GB flash memory. 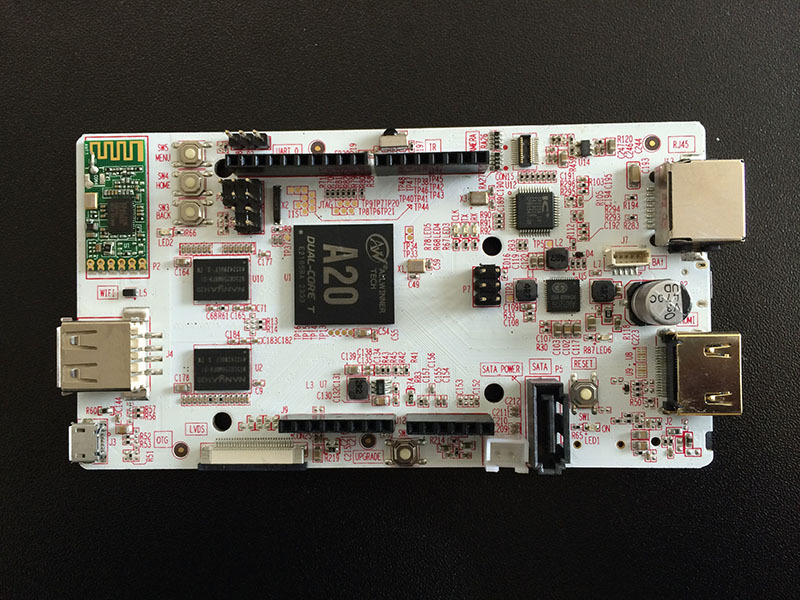 You can immediately begin working with the pcDuino3 without any installations perform. This device has a microSD card reader available, and can also be booted from a microSD card (e.g. Android 4.2.2). In general, the device will boot first from the Flash memory. If a microSD card is inserted with an operating system, then the device will boot from it. You can also use the SD card slot as well as a memory expansion (up to 32GB) over the possible SSD or hard drive connected by the existing SATA interface. Another highlight is the compatibility with all Arduino Shields. Those can be immediately installed on the pcDuino3. There exists a translational Board for 5V Shields if needed. Arduino IDE is also preinstalled. You can directly “go for it” to run Ardunio scripts. The device also preinstall the “SCRATCH” programming language that is widely used in schools and universities. It provides programming newbie and kids a simple introduction to the World of programming and electronics. Similar as “Lego,” it uses a graphical user interface with all kinds of “program blocks” to do a whole program. So if first successes are achieved in an instant, the desire is to make MORE. 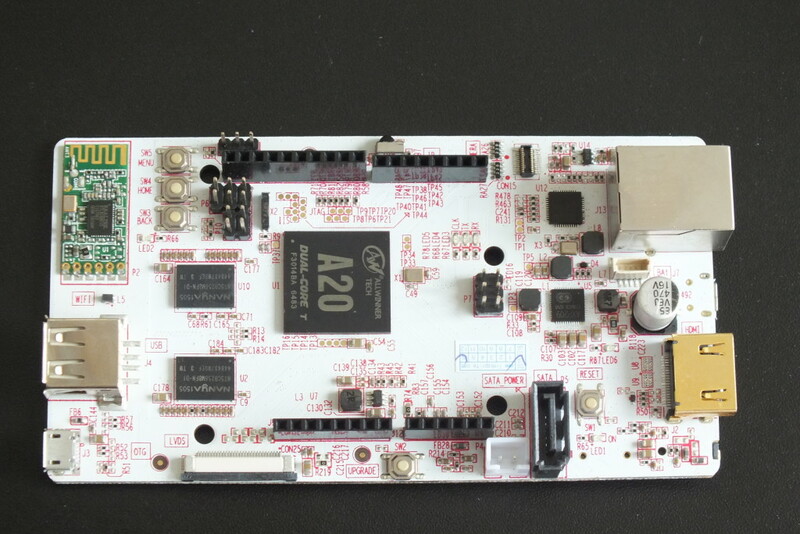 Unlike other single board computers with only digital inputs/outputs, the pcDuino3 is also equipped with 6 analog inputs/outputs. They can be used to control analog devices like the Arduino temperature sensors, light sensors, and much more. Another interesting feature of the pcDuino3 is the built-in USB OTG interface. It provides an option to be accessed from a connected Windows PC with a USB network interface via VNC-Remote Desktop software installed on the pcDuino3. Thus, the pcDuino3 can be operated without screen, which is a very useful feature for some applications, e.g., specific measurement or control tasks. Since the pcDuino3 is designed for 24/7 suitable, and can be deployed with an outside temperature range of up to 80 degrees, it is very suitable for professional and industrial applications. Lithium polymer battery can be connected and loaded by the existing standard battery interface. This makes far-reaching, mobile applications possible. With the existing LVDS interface, LCD monitors can be operated directly. Furthermore, the pcDuino3 has a CSI port to connect to a CSI camera, as an extra option beside USB cameras. The device is completely open source, so users can program their own projects without any restrictions. For this purpose, there are a lot of detailed Information, circuit diagrams and programming examples on the homepage of pcDuino3. EPS file for Acrylic pcDuino3 enclosure.